Affordable quality! Our VTX high grade, wide flanged, “quiet iron” Olympic grip plates feature 3 slotted gripping areas (45lb, 35lb, 25lb and 10lb only) that actually raises them off of the ground, providing easier lifting and loading from a prone or angled position. The durable coating protects the plates, floors and other equipment from damage. Raised reinforcements on both sides of each grip slot help make it a true institutional plate and the choice of trainers, world wide. Center bores are precision drilled for a snugger fit on most 2” Olympic bars. The VTX Olympic Grip Weight Sets GOSS-400V is what you need to keep up with your workouts? The Troy VTX line of coated grip plates offers superior quality and looks at a great price! The VTX Olympic Grip Weight Sets GOSS-400V offers stylish Coated VTX Olympic Plates with a three grip design. Plus, this 400 lb Olympic Set comes complete with the Troy USA Sports GOB-86 Chrome Olympic Bar. This Troy VTX 400 lb Olympic Weight Set offers a light commercial grade olympic grip plate combined with a home use olympic bar. You can experience some of the highest quality Olympic & Regular weight sets on the market today with VTX. FitnessZone carries only the finest affordable weight sets using the best ASTM-Grade 20 iron, precision milled rims & radius edges for a truer shape & dimensions. All plates are individually weighed, inspected and calibrated to ensure that our sets are consistent in weight, size and quality. Call 1-800-875-9145 to speak with one of our fitness advisors with any questions you may have about any of our barbells and plates. Get Motivated! - Step up your fitness program today and go to FitnessZone.com to order your VTX Olympic Grip Weight Sets GOSS-400V. 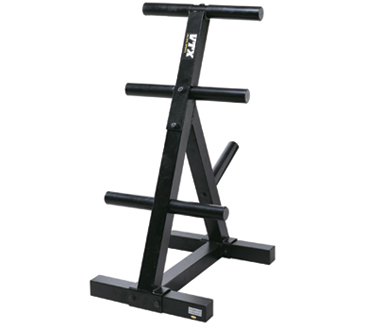 This is a great set for high school weight rooms or for the home gym owner looking for a premium set. Product Description: The Olympic Plate Tree hold all 2” plates and can be used for home or institutional applications. VTX product line comes with a full 1-year warranty, against manufacturer’s defects or breakage through proper use to the original owner. 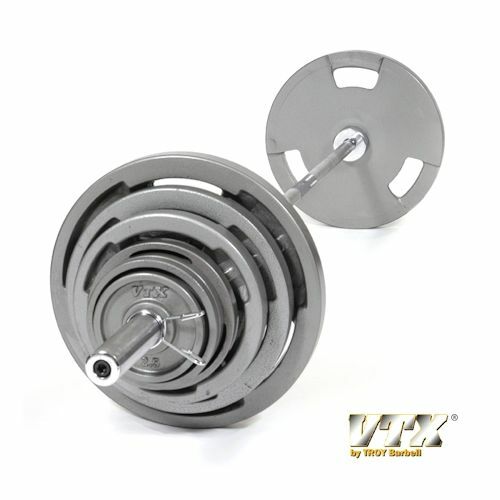 Order your VTX Olympic Grip Weight Sets GOSS-400V from FitnessZone.com today!